"When we reached our destination at two in the morning we went straight to the... Inn. I was tired and had to sleep in the laundry room with [another girl], but it wasn't too bad because there was a pull-out sofa in there and [she] didn't snore..."
"I really didn't mind [the laundry room], it's all about the experiences we have and what we make of them plus it's a great story to tell people." "Talk about distance driving! Any further and... we would have made it to the north pole via the south pole." "The area we went through was vastly different than I could ever have imagined Illinois... Africa collided with the North American Continent [producing] the Illinois Basin, the La Salle Anticlinorium, the Ozark Dome, the Cincinnati Arch and the Rough Creek Graben all [of which] sort of intersect." "The first stop we made [on the official ISGS field trip] was at the Garden of the Gods... [erosional features formed from] Pounds Sandstone... The natural rock formations were breathtaking... Camel Rock appeared from certain vantage points to be indeed a camel in silhouette." "[We also saw] Liesegang banding... caused by iron... in groundwater... the iron congregates in these unique bands." 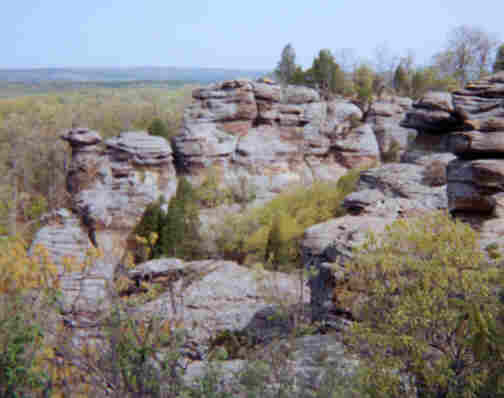 "[which] reminded me of iron framboids at Buffalo Rock State Park." "I think a lot of people had different opinions about the next stop." "The next stop was fun... Lee Mine is an abandoned fluorspar mine... the hike back to this site was... beautiful... carpeted with bluebells... we came to a spot to cross on some stepping-stones... several people began to find small pieces of fluorite..."
"I had a hard time getting good samples of fluorite and I really did not like this stop at all. Then we parked at Rim Rock for lunch and a trail hike. "This seemed like a very mysterious place. We walked along the trail, which descended down some stairs between two towering rocks. The temperature noticeably became cooler as we went lower into the crevasse. Water permeated the walls of rock and dripped down the sides leaving discoloration... and mosses and the like." 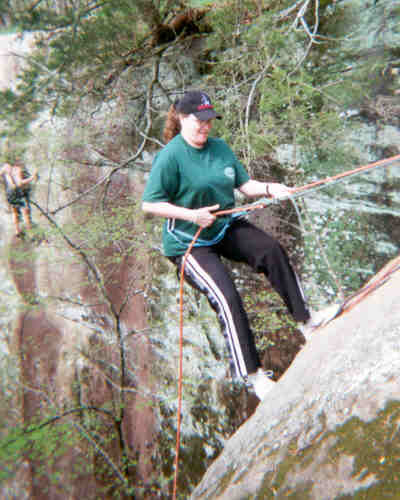 "I walked along so very scary high trails, and I also walked throughout the crevasse called "fat man's revenge." "We were trying to see if there were any fossils under this [rock] but we didn't find any." 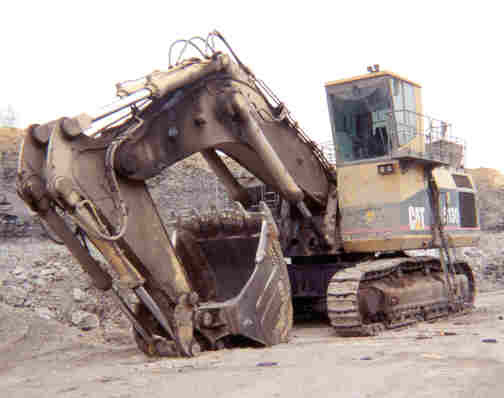 "[At Jader Mine] there was a pile of black shale that contained Pennsylvanian fossils.. The ISGS said that they think that the coal in the pit will be depleted in about a year at which time the land will be reclaimed." "We were instructed to stay away from the high wall, which was a good idea, because rocks came tumbling down the whole time... Kami found a decorated ammonoid and Jason found some [too]... Once again, I found absolutely nothing, and we were moved out before we really had a chance to collect anything." "I found a pyritized gastropod, some leaf prints and other trace fossils... On the highwall... was a shear point where the rock had been buffed into a nearly smooth swath by faulting action." "I wasn't having much luck, I was only getting dirty. Soon we were told it was time to leave. I was upset, I didn't find anything, so I found a big piece of shale, raised it over my head and dropped it. It split apart and there was a fossil bivalve! I was very happy." "My favorite stop of the day was the Horseshoe Upheaval. here I found an excellent trilobite... the rocks... were upturned at nearly a 90 degree angle and were about 350 million years old. This would put my trilobite, which I named `Freddie Mercury' after another fabulous fossil, into the Mississippian." "I found a trace fossil... some mollusk shells and some leaf prints [at Horseshoe Upheaval]." "This was particulary cool because someone had just told me that no one would find any fossils and if we did they would be unrecognizable. Who did he think he had there? He did not know about our class!" After leaving the ISGS field trip with barely 1.5 hours of daylight left, we drove to Rosiclare and found that "[fluorite] was everywhere, it was the stuff the mine didn't use... I even found some black crystals. Donna's husband found the most spectacular trilobite. It looked like it was alive." "I also found my only fossil of a trilobite here. I was excited... because my main goal in these field trips was to find a trilobite." "Matt and his wife found Archimedes screws! You told us about them in lecture, and you're right! They look just like drywall screws stuck in some kind of grey shale." "This is where stuff got fun and interesting... Kami's car was... making a mess of the driveway to the gas station [at Rosiclare]. Most of the men on our trip are probably better with a rock hammer than a water pump and luckily some local decided he would/could fix it." "My least favorite part of the trip was when my car broke down and spit coolant all over... Everyone stuck by me and reassured me that it was not my fault - that it was going to be okay." "The local people were great. They found the guy who could open the parts store. They opened the parts store at 7 p.m. on Easter Saturday Night. And they had the part that fit. Then, he went home for his tools. 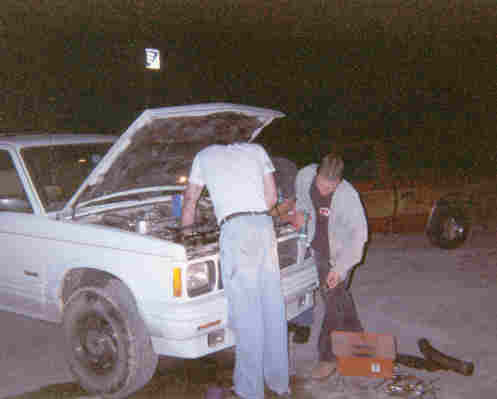 And then he stood out in the middle of [deleted] nowhere, using the headlights of pickup trucks to put in a new waterpump in 1.5 hours flat. And he never extinguished his cigarette, even when he was right over the engine! Must be real boring in that town. We were something interesting to do." "We set up for dinner on the church grounds... we had a great time laughing and ... waiting for the car to be fixed." "There was a definite change in the group -- we were a single unit. In 45 minutes we went from classmates to buddies... Would not have changed a thing and would even sabotage somebody's car next trip so we could do it again." "Next comes the scariest ride of my life up and down the back roads to find the campground." "Then we took the world's craziest drive at 20 mph, which by the way felt like 50 mph." "That was the first time I ever learned how to set up a tent. I snuggled in for the night but I couldn't sleep... then it started raining... I woke up the next morning a little wet around the edges... I was happy because I actualy camped, something I had wanted to do for a long time..."
"Then came the storm... we got up and ate breakfast and had coffee. Everyone was great, sharing and helping others. The day turned out to be warm and sunny." "The stream got really turbid overnight; you could see how the color changed from clear before the storm to muddy after the storm." 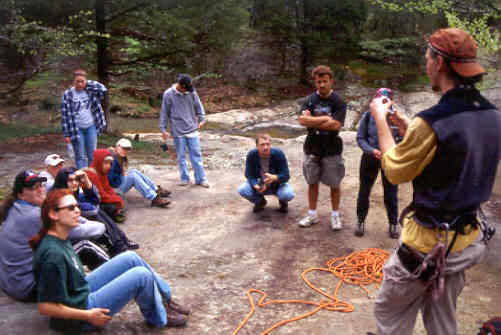 "Then we learned how to go down into the canyon on safety gear. 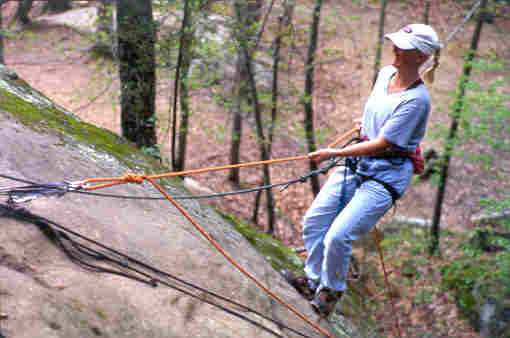 We all thought `how cool we are,' until we saw some climbers zip down their rope so fast, smile, wave and go. But we were just learning, so we went slowly and carefully." "It was so fun! I felt like Wonder Woman, like I could do anything." 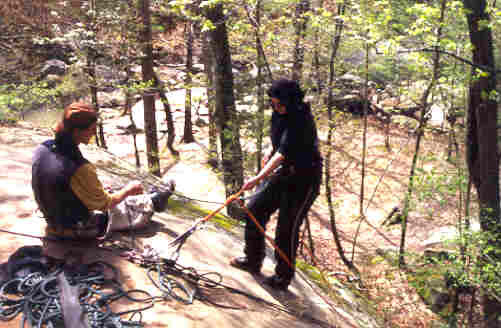 "[We went] rapelling in Jackson Falls. This was one of my favorite parts of the trip. 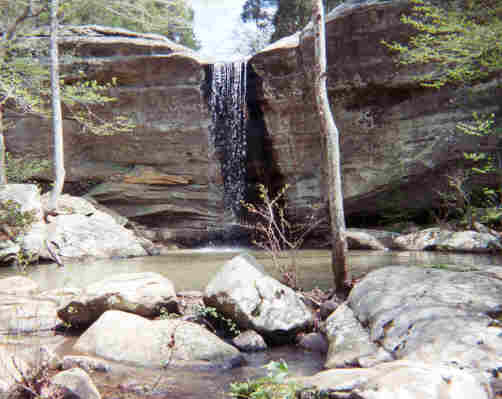 There were waterfalls and creeks and rock formations that had been shaped by time. It was a great ending for a great trip and an awesome class... I know that however long we are all at this school that every time I see one of my fellow historical geology classmates... I will feel that connection of friendship with them. I only wish that we could have had some kind of trip like this a year ago." "Overall, these field trips have been really cool. 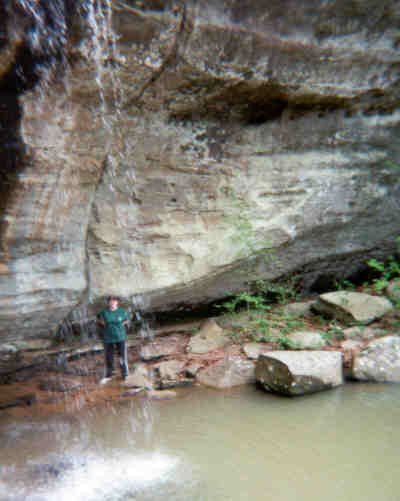 I have been able to understand things much better because of reading about faults, bluffs, caves, waterfalls, and fossils, I was able to see them and experience them for myself." "I have to say that it was an experience that I'll never forget. I didn't want it to end... I looked out the window [going home] at the perfect roundness of the setting sun and though to myself, I'm glad I came... because it opened my eyes to all the countless possibilities out there. I made a promise to myself that day to keep my mind open and explore all the places that I only dream about. 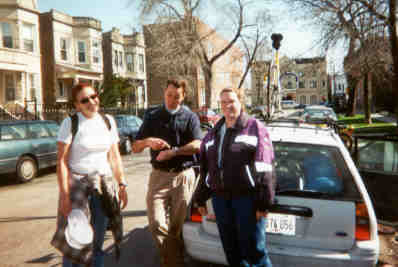 Maybe one day I'll be leading a classroom of students on a field trip of my own..."
Matt Rubschlager's photos from Spring 2001 field trips show Kankakee, LaSalle and photos from our downstate Illinois trip. Illinois Bedrock Geology from the Illinois State Geological Survey is a new full-color image. 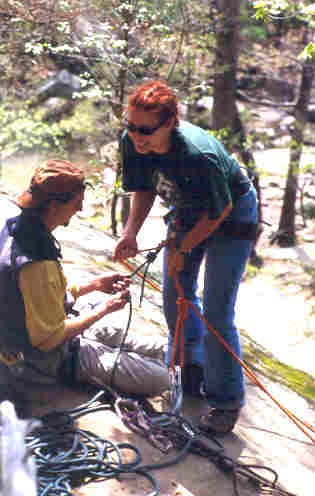 U.S. Forest Service Shawnee Website. Geologic Overview: The area is heavily faulted and uplifed from east to west. The two high points are Bald Knob at 1,048 and Williams Hill at 1,064 feet. 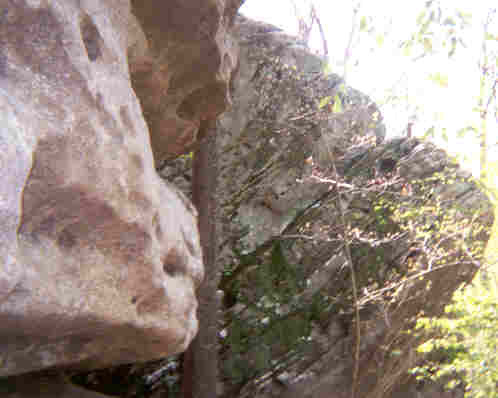 Most of the rocks are sedimentary and relatively flat-lying. Some igneous and metamorphic mineralization is known. "Fluorospar is mined in Hardin and Pope counties. Over 200 million years ago, a mass of molten magma pushed up from the earth's interior and bulged most of the area of Hardin Counties, Illinois, into a huge dome. During the ages that followed, huge dikes of black igneous rock from the abysses below split the region in many places from southeast to northwest. When the period of volcanic activity ceased, the molten magma began to cool and contract, and the many mineral components of the mass began to separate out. As the mass shrank and subsided, the region collapsed into a series of long, narrow fault blocks... through these fault fractures...gasses heavy with fluorine, lead, zinc, barium, and with small amounts of cadmium, germanium and silver [rose]. During a period of certain temperature and pressure conditions, a chemical reaction took place between the gases and the rock walls of the fissures, and the minerals were deposited in veins and as replacements of limestone beds. Thus were formed the ore bodies of fluorospar or fluorite (CaF2), sphalerite (ZnS), galena (PbS), barite (BaSO4), and calcite (CaCO3... At the close of the Pennsylvanian geologic period, 200 million years ago, the area stood high out of the sea and was subjected to erosion. The long years of weathering removed some 3,500 feet of the domed area, leaving the relatively low and scenic hills of today, and exposing for discovery veins and bedded deposits of fluorospar." 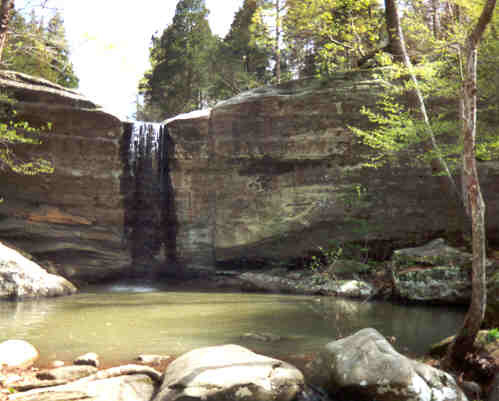 Jackson Hollow: Possibly the most beautiful spot in Southern Illinois but accessible only by horse back and hiking. The only spot with a parking lot allows a twenty foot drop into the canyon. Incongruously, a railroad runs through it, although you would never see it until next to it. It goes through the longest tunnel in Illinois. Hicks Dome: Pilots flying over this hill were amazed to see the shape of a volcano from the air. In a region of sedimentary rocks, there are some igneous outcropping, many faults and unusual surface formations all caused by some event. 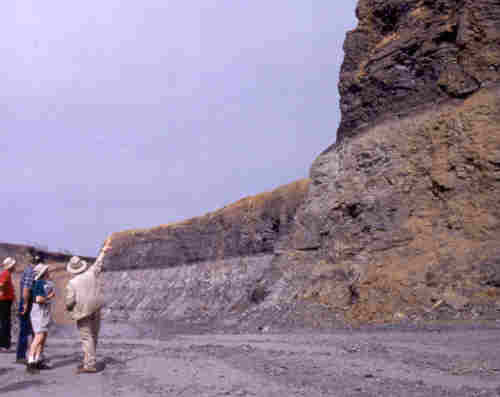 The first geologic report suggested that a volcano exploded before reaching the surface but bulged the the surface approximately 150,000,000 years ago. The event is referred to as a "cryto-explosion" since they did not precisely know what happened. This is not how Hicks Dome formed. We now know that Illinois over rode a hot spot, creating this igneous intruded and faulted structure. Saline County Fish and Wildlife Area - Saline and Gallatin Co. is operated by the Illinois Department of Natural Resources. At 2,200 acres, SCFWA is one of the largest state-owned sites with many features not found in better marketed state parks. 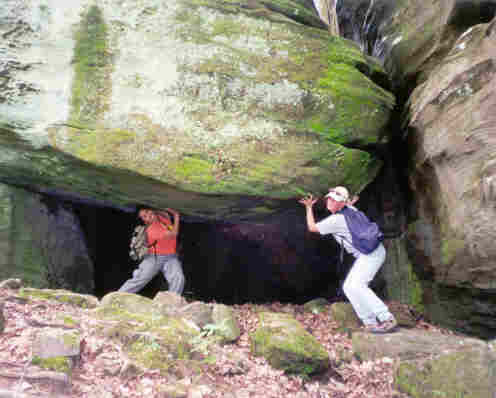 Attractions include Glen O. Jones Lake, Cave Hill Hiking Trail and three shorter trails, and Upheaval at Horseshoe, an interesting geological formation." The Cincinnati Dome has long been one of the most famous Ordovician fossil areas in North America, particularly for bryozoa. The dome covers a large area of southeastern Indiana and adjacent parts of Ohio and Kentucky. 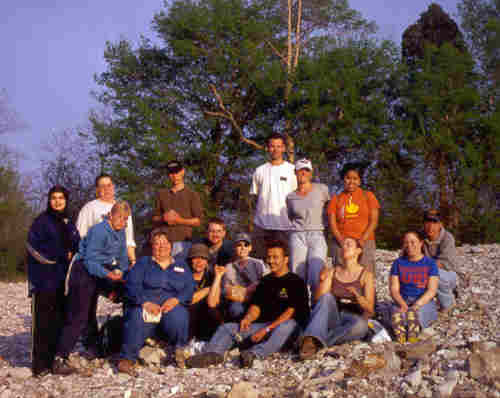 Bryozoa Page University of Kentucky shows some southern Illinois fossil hunting localities. "KY Highway 131 road cuts: A new series of road cuts between Interstate 65 and Fort Knox contains geodes and fossils. The geodes can contain calcite which may be highly fluorescent and/or phosphorescent... fossils are from the Mississippian age and include brachiopods, crinoids, shark teeth)." "Taylorsville Road Cuts, Spencer County, KY. Upper Ordovician fossils abound in the numerous road cuts around Taylorsville. Brachiopods, byrozoans, cephalopods, clams, corals, scolecodont teeth and snails are often found. 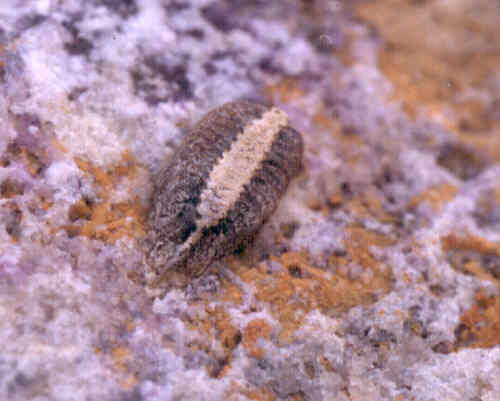 In certain road cuts, many brachiopods are lined with calcite crystals and sometimes with dolomite and celestine." "Sulphur Road Cut, Crawford County, IN. 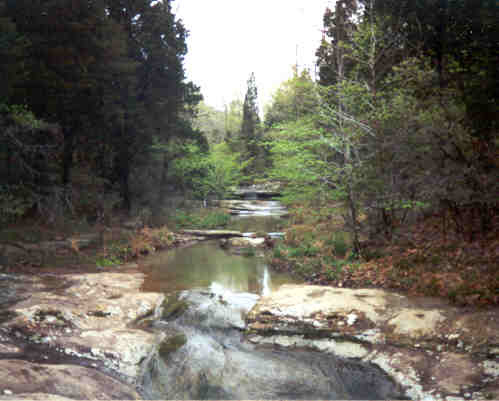 This is a famous Upper Mississippian fossil locality. It is known for articulated crinoids, abundant blastoids, Archimedes bryozoans, brachiopods, snails trilobites and trace fossils. Vertebrate remains include a variety of shark teeth and dermal scales, and rare coelancth and chimerids remains." Quotes from a now-defunct website.